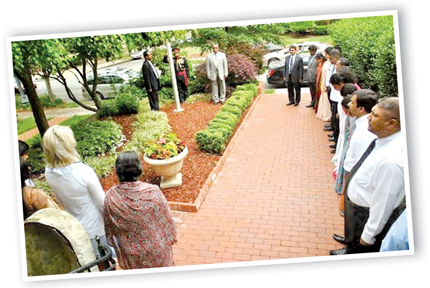 Ambassador Prasad Kariyawasam and staff of the Sri Lanka Embassy in Washington DC and the staff marked Remembrance Day on May 19, by observing a minutes silence followed by a ceremony. He spoke of the national commemoration of Remembrance Day, which was held in Matara. The significance of this year's commemoration was fostering reconciliation to unite the hearts and minds of the different communities in Sri Lanka. The commemoration was reflective of the Declaration of Peace adopted at Sri Lanka's 67th anniversary of independence on February 4th this year,. The Ambassador spoke about what President Maithripala Sirisena said at the national commemoration in Matara that the Government's policy is 'development and reconciliation', observing that "we cannot fulfill our expectations for reconciliation only through development. The reconciliation process primarily includes truth, seeking justice, eliminating fear and mistrust, building trust among the communities and rebuilding destroyed physical infrastructure. Hence, with the experiences of the war, we must understand the utmost need for a reconciliation process." A Designer Clearance Pop Up Store will transform Park Street Mews into a retail therapy hotspot as three entrepreneurial women, Catherine Obrenovic, Latika Alok and Leigh Miller, forces behind Touche, Glitterati and Azure Luxe and Originals Furniture get together to create a five-day shopping experience. The deluxe Pop Up store will be open for late night shopping for Colombo fashionistas who can shop, socialize and network over cocktails. Touché Collections are designed for the modern woman with material imported from Italy. 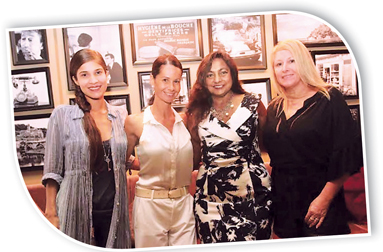 Glitterati is a Singapore Fashion House. Glitterati's haute couture pieces are fashioned in silks and chiffons. They specialize in glamorous gowns and chic cocktail dresses. The collection is available for private viewing in Colombo. Azure Luxe Beach Wear is a lifestyle clothing brand featuring swimwear, beach wear and resort wear. The Collection is available at Aussie Swim Store, Crescat Boulevard, Colombo. Originals is about individuality, a simple, clean, contemporary style seen in the mix of old and new teakwood furniture and the contrast of assorted materials of glass, stainless steel and iron. The aim is to create a modern living environment that can translate to any country and lifestyle. A 20% discount for the event week only and a 40% on all serax and sati kebon items! June 3: 5pm to 10.30pm, June 4, 5 and 6: 12 noon to 3pm and then 6pm to 10.30pm. June 7th: 11am to 3pm. Café Francais will offer a special menu for June 7, 'Brunch A La French'.